I got up around 04:00AM on December 21, 2008, to hike Thunder Mountain in the dark. I hiked up in the freezing cold, through 4 feet of snow, uphill both ways, fighting off the mountain lions the whole time. Seriously, the temperatures were around the upper 20s when I started. I got up to the top about 30 minutes before sunrise. When the golden rays of sunrise reflected off of the Peaks, it was all worth it. 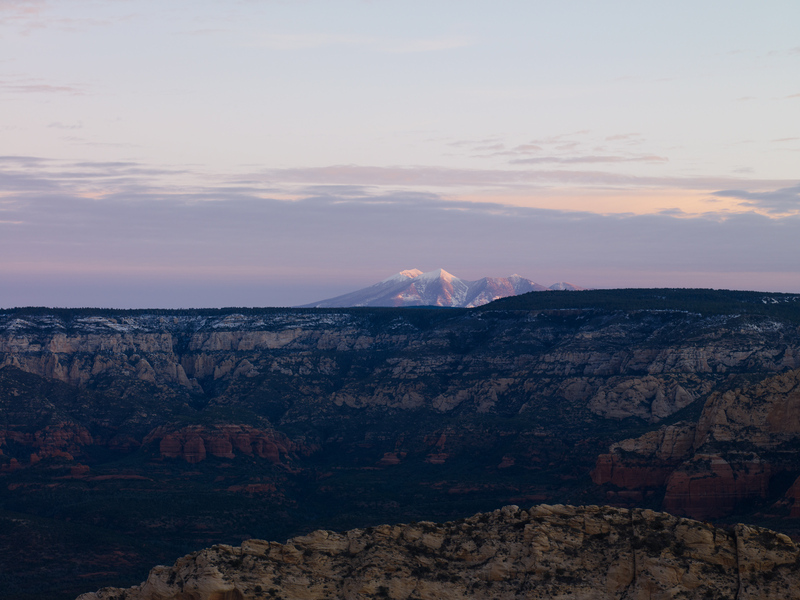 In the foreground are a couple of buttes in Sedona. I took this photo with my MAMIYA M645 AFD-II medium format camera and PhaseOne medium format digital back with a 75-150mm telephoto lens.